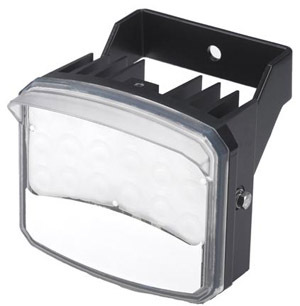 The Aegis UFLED White-Light illuminator delivers even-illumination for distances up to 60m (195ft). The Aegis UFLED intelligent white-light illuminator combines innovations in technology and design to deliver absolute performance in security lighting. Powered by award-winning Black Diamond micro-refractive technology, Aegis UFLED White Light delivers even illumination which lights the foreground and background of the scene eliminating hotspots and underexposure. The IP67 rated Aegis UFLED White Light features a 12 VDC / 24 VAC power circuit built into the illuminator to allow the unit to be powered directly. Where mains operation is required separate power supplies are available. The Aegis UFLED delivers even-illumination for distances up to 65m (195ft). [Find out more...] Bosch Aegis UFLED White-Light Illuminator "Technical Specifications". [Find out more...] Bosch Aegis UFLED White-Light Illuminator "Technical Data Sheet", 874 kB pdf file.